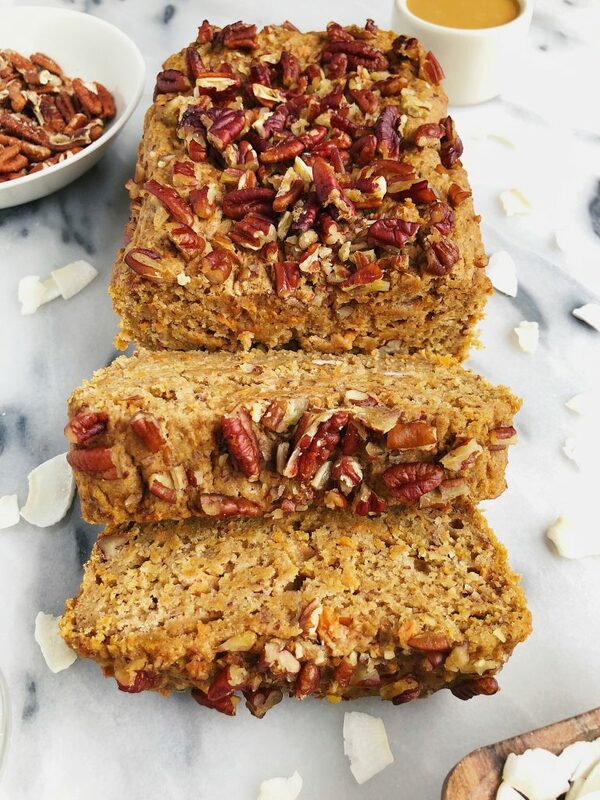 One-Bowl Healthy Vegan Carrot Cake Loaf made with sprouted spelt flour for a healthier carrot cake recipe! Remember when I posted a teaser about carrot cake a few weeks ago and you guys went CRAZAY?! I seriously have received at least 3 messages a day (usually more) asking when this will be up. I had it originally planned for later in April, but silly me forgot that this would be an epic Easter recipe for anyone celebrating. Or really just for anyone who wants a delicious carrot cake loaf on a Sunday.. 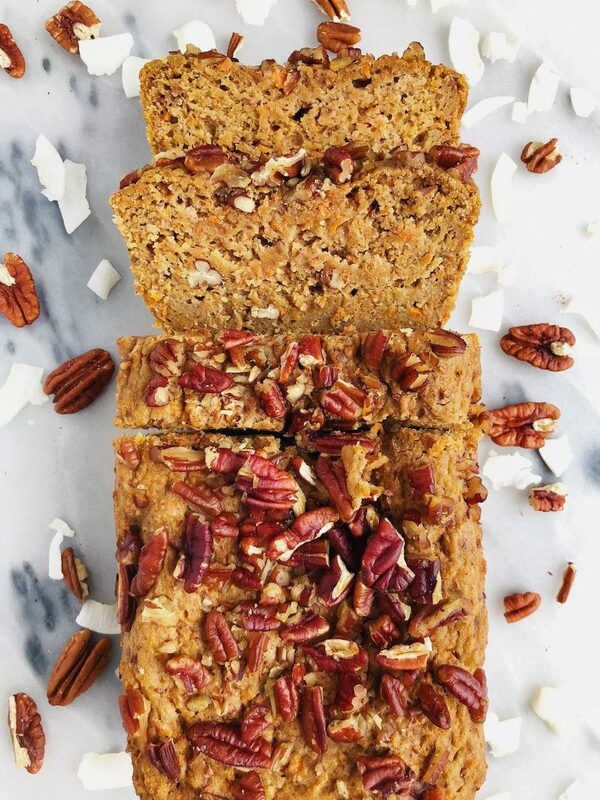 Okay, so let’s get to this Vegan Carrot Cake Loaf. We are pretty much combining banana bread and carrot cake into one perfect recipe. No, I do not use bananas in this, but it does have that banana bread texture and consistency. I love how it is very simple and easy to make (only one bowl to clean!) and it is a recipe that you can feel good about eating for breakfast, dessert or a snack. Anytime of the day works for me friends. I used my beloved sprouted spelt flour from One Degree Organics for this loaf. I have been using this flour for everything. It is such a subtle flavor and it is very easy to bake with. It works as a 1:1 sub for regular flour and while it isn’t technically gluten-free, many who cannot tolerate spelt flour can indeed enjoy sprouted spelt flour. Obviously eat at your own risk, if you know spelt flour doesn’t work well for you, you can sub oat flour (I also make this with One Degree Organics Rolled Oats). Now let’s make some dreamy Vegan Carrot Cake Loaf and eat our faces off. Here are a couple other carrot cake recipes too for ya! Will stay good on counter in airtight container for 3 days or in fridge for 5, freezer for 2 months! Can you use whole wheat flour with this recipe? Hi! Can you substitute coconut or almond flour for the spelt flour here? So I tried this this morning, and I subbed two things because I didn’t have the ingredients. My experience was quite interesting to say the least! When I mixed everything before putting it in the tin, it looked like a GREAT consistency and was so excited! To my surprise… everything became LIQUID in the oven!! WEIRD! – Almond Flour instead of Spelt – I used a conversion chart comparing flours to All-Purpose flour and figured the conversion would be around 1/2 cup of Almond Flour… but I ended up adding an extra 1/4 cup because it seemed like it needed it. So all in all 3/4 cup of Almond Flour – maybe I needed more?! I took the loaf out after figuring there was no way it would be baking in the over, and it actually began to set a little bit once I pulled out it (we’ll see what it looks like when I’m home!). I’m new to working with specialty baking items – what are your opinions on why this could have happened? It seemed as though all of the oil rose to the top and just sat in a liquid state! hi rach! if i wanted to use an egg/eggs instead – how many would you recommend for this recipe? i haven’t tried ! i recommend using the flax eggs but the loaf would probably need 2 eggs. keep me posted! can i substitute ¼ cup of maple syrup and cut back ~1tbsp of liquid to replace coconut sugar ? Is there a good sub for the coconut oil? Could I sub out the applesauce for banana? Or additional coconut oil? What’s the best flour to sub? Oat flour or Bob’s 1:1 or another? Thanks!